I have for you the perfect piece of artwork to hang in your home or office and it will cost you less than $10. Doesn’t that sound awesome? Yeah, I thought so! So now it is time to get this unique piece of artwork up in your home. 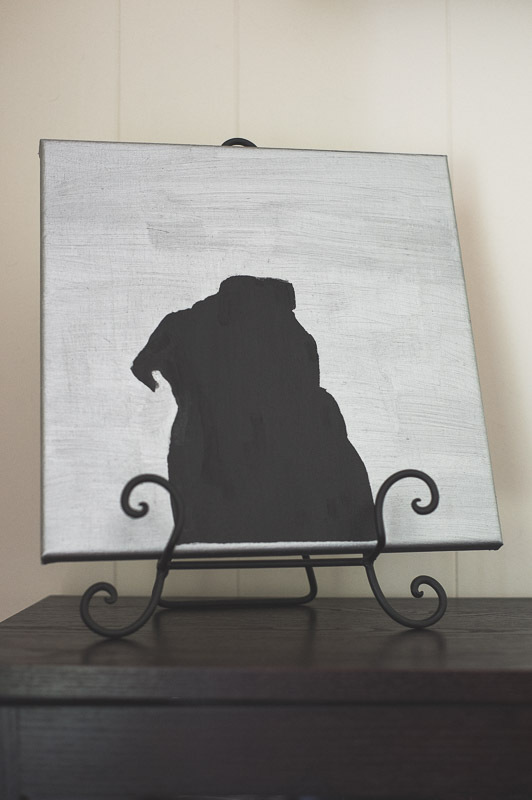 I have this awesome DIY Silhouette Canvas Art tutorial for you. And it won’t take you too long either. So here we go. This is really simple, fun and will look great! I started by choosing a photo of Ref that would look great as a silhouette. 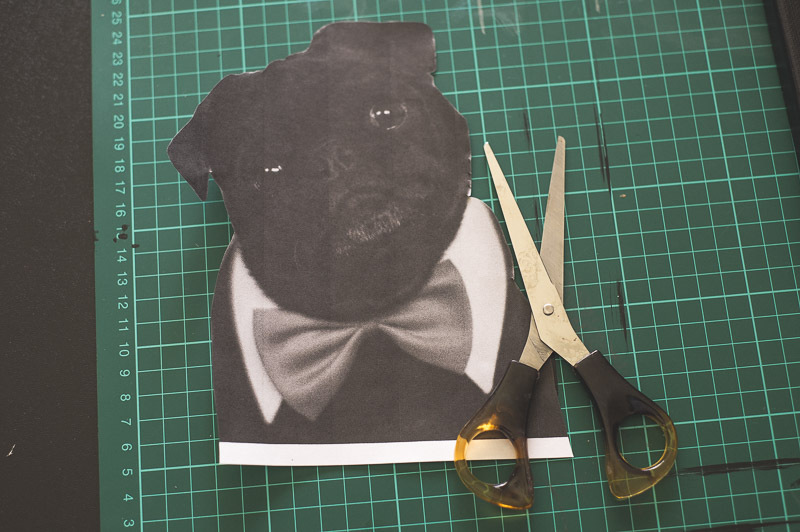 Go for a photo that has very distinct lines so that when it is a solid colour, you can tell it looks like a pug. I chose a classic head tilt photo. I printed this on some A4 paper. This can just be done in greyscale to save on ink as it is only a template. Now choose your base colour of paint to apply to the canvas. I went with the black chalkboard paint as this is the colour that the silhouette of Ref will end being. 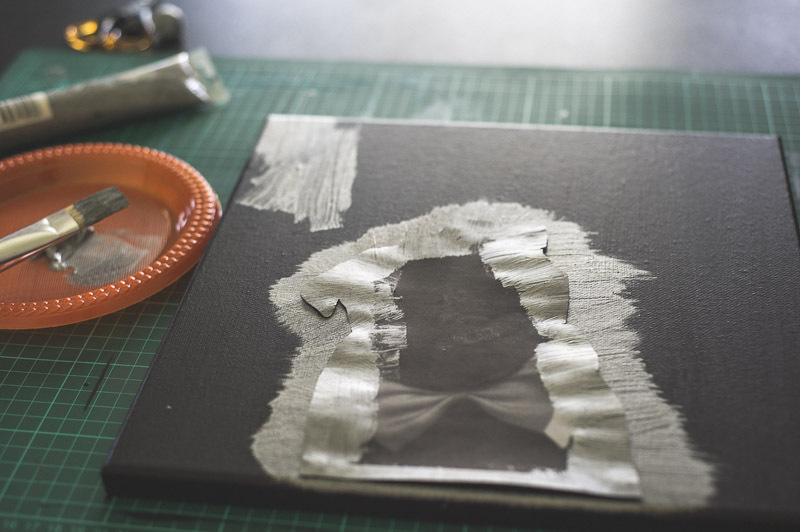 Make sure you have your craft mat or newspaper underneath so you don’t get paint on your table. I applied 3 coats of this so that it became nice and solid, allowing it to fully dry between coats. 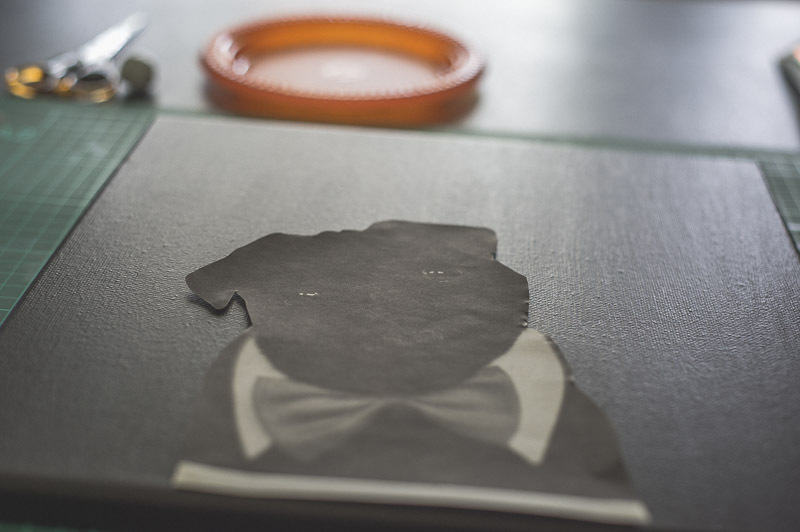 Once the third coat is fully dry, cut out your chosen photo so you are left with the silhouette of the photo. 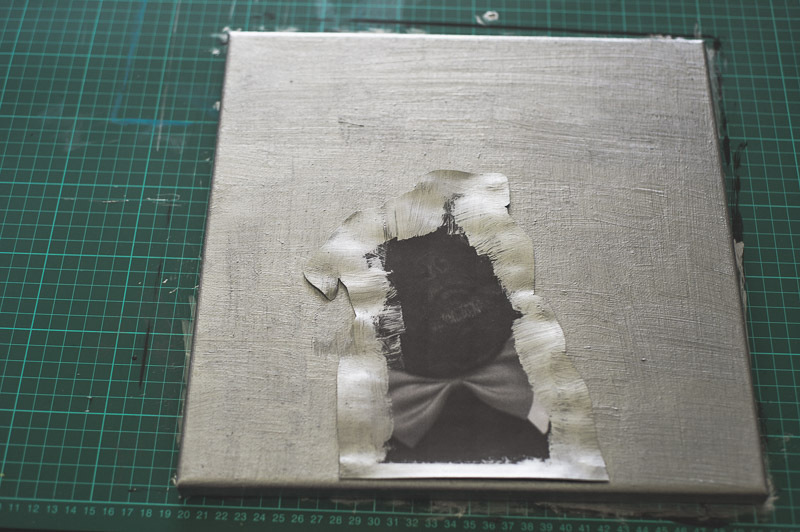 Using a small amount of blutac, carefully place your cutout of the photo on the canvas in a position that you like. I used blutac so that it will stay in place without doing any damage to the base coat of paint when I remove it. Now you can start applying your top coat colour. For me, this was silver. I applied it from the inside of the photo out so to avoid getting any spillage. 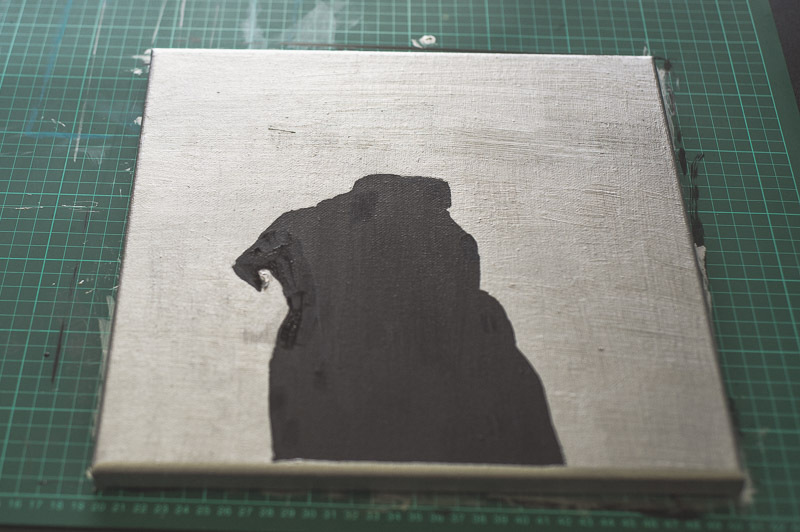 I applied 3 coats of the silver paint as well, ensuring that each coat was fully dry before applying the next. Once the third coat was applied, I carefully removed the photo. I had a little bit of spillage so I carefully wiped as much excess off as possible and then did some touch up with the black paint. For less than $10 and roughly an hour of my time, I have created this unique piece of artwork of Ref to display at home. It is a one of a kind piece and I can guarantee it won’t be found in any stores. 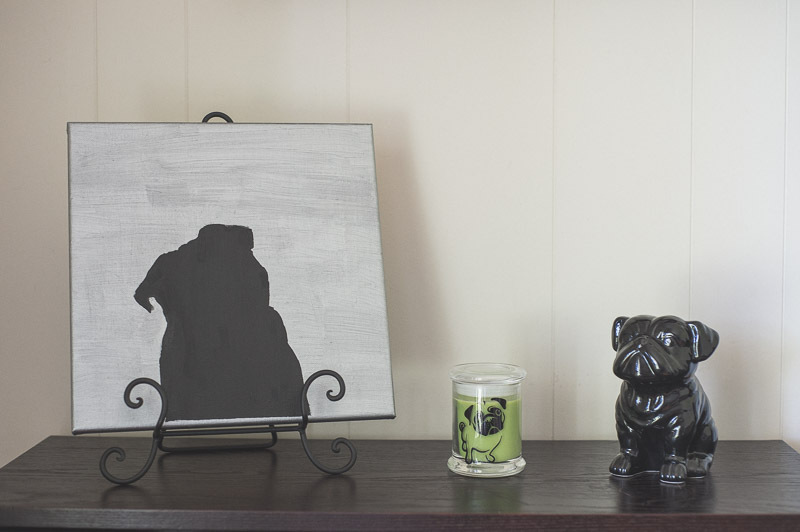 I would love to see how you have gone with our DIY projects including this Silhouette Canvas Art and our previous DIY Chalkboard Treat Jar. 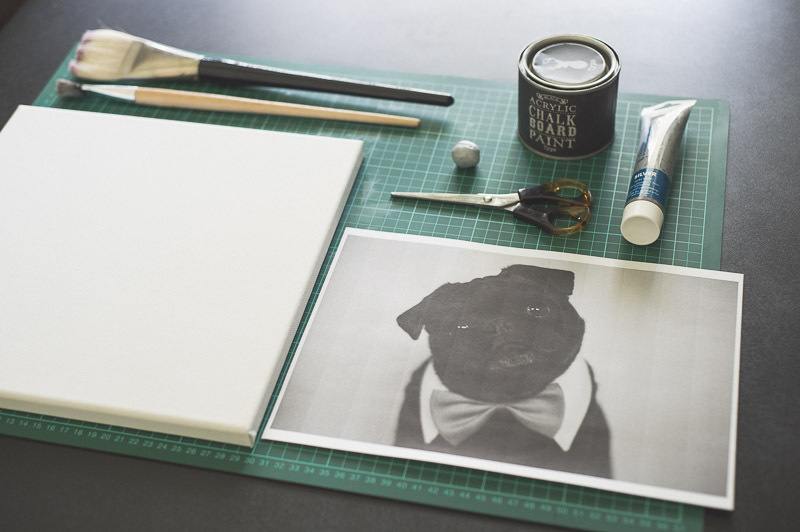 Post a photo to our Facebook wall, tag us on Instagram using #thepugdiary or Tweet us a photo of your finished artwork. And don’t forget to let us know what you think of this project in the comments below. I am SO trying that out with our pooch! He’s a handsome border collie x cattle dog 😉 It looks about my level of artistic skill so I’m not too daunted. Thanks. It is nice and easy to do. Please do share the finished result with us on Facebook or Instagram. We would love to see it even when it’s not a pug cause we just love dogs. Looks great! It would be great to do mini versions too for greeting cards 🙂 I love the lightbox in the last pic. I’ve just ordered one from Typo. Couldn’t figure out where I’d seen it before and now I know it was here. 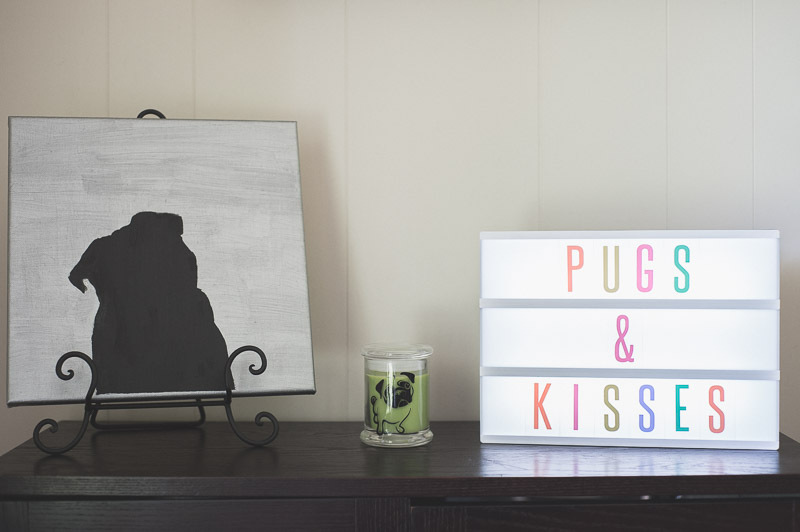 You provide lots of inspiration thanks Pug Diary. Thanks Amy! This would definitely work great for greeting cards too. I have a few other DIY posts lined up for upcoming months that I’m sure you will like as well. Oh I love the Lightbox from Typo. I also got extra letters for it including gold, pastels and additional black letters. I wish I had actually got the bigger one of the two but I still love it anyway. You will love it too.